“Through A Glass Darkly” begins the trilogy of Ingmar Bergman films dedicated to wrestling with God and faith. Different from the Bergman classics before it (“The Seventh Seal” and “Wild Strawberries”), “Darkly” is a much more intimate confrontation of life’s toughest questions, holding itself to a cast of four: three of whom are immediately family and one who is married into it. The distance shrinks between the viewer and the cast and the drama tenses up. It might feel less imaginative and creative than the films of the ’50s, but the narrower scope keeps the attention where Bergman films require it the most: on the characters wrestling with reality and faith. 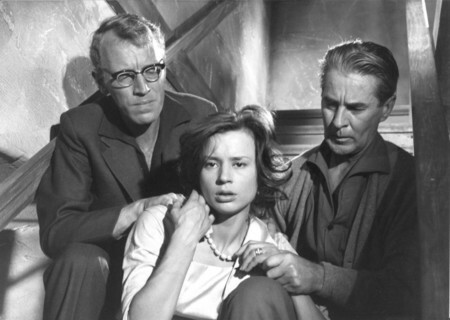 Harriet Andersson as Karin, a young married woman home on the family island after being treated at a mental hospital, is the focal point of “Darkly” and she wears the part well. Karin is lost somewhere between reality and hallucination — clearly able to see her own hysteria but powerless when it comes to doing anything about it. Andersson possesses and utilizes all the tools to both captivate and even frighten us with Karin’s ordeal. She absolutely steals the film, even though Max von Sydow as her husband and Gunnar Bjornstand as her somewhat estranged father deliver heartfelt performances warranting sympathy. Karin’s illness has its effects on all those who love her, the two aforementioned characters and her younger brother Minus (Lars Passgard). As she simultaneously breaks with reality and descends into madness, these characters suffer their own crises. Martin, her husband, deals with how cold and distant she grows and must realize what loving her really means. Von Sydow’s performance elicits the most pity of the lot, but only because his love for Karin put him into this tough situation unbeknownst to him. There’s no lack of pity for the others either. The father is a writer feeling tremendous guilt for having been away from the family for so long to turn his next work into a success, a work that gets its creative spark from Karin’s condition. The brother suffers from a growing sexual frustration and lack of experience as far as love goes, which causes him to try and draw a connection to understanding it through plays that he writes. Love is the uniting theme of the film. Bergman suggests that the easiest way to reconcile the presence of God in a world full of heart-breaking reality is to see love and faith as intertwined. The film’s only upfront confrontation of God comes in the last scene when Minus asks his father about it point blank. Up until then much of this comes somewhat cryptically through Karin’s vision of lit faces waiting for the door to open and God to show himself and her subsequent hysterics, but thankfully Bergman addresses it up front and gives you something to form a theory around. “Darkly” exemplifies what Bergman does best, just in a different way than his previous films. More down-to-earth, human drama between characters acts as the tool — not excessive symbolism or other metaphysical elements) — to scratch at those tough questions about mortality that force us to look through a glass darkly.